Liisa Pohjola , born in 1936 in Seinäjoki , can rightly be called a Finnish piano legend. For more than half a century she has become the top as piano artist, both as a performer and educator . 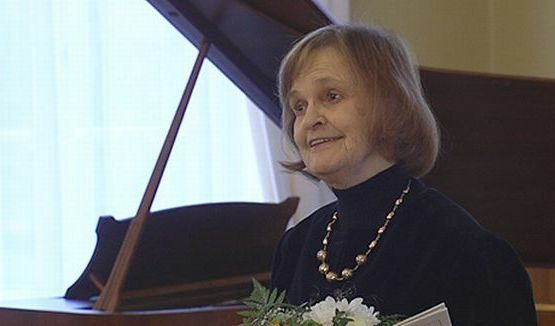 She had her debut concert at the Sibelius Academy in 1955 and has since had extensive assignments as a soloist with performances throughout Europe. As a chamber musician she has worked with a number of top international artists. She is an outstanding interpreter of particular contemporary music and has premiered a large number of works , including compositions by Erik Bergman, Kalevi Abo , Pertti Jalava and Mikko Heiniö. Liisa Pohjola can not be mentioned without highlighting her extensive and dedicated work as an educator for Finnish pianists, first in Turku, and since 1965 at the Sibelius Academy, where she was appointed professor in 1976 and is still employed as an emeritus professor . Liisa Pohjola comes from a very strong musical family and is the sister of three other prominente Finnish musicians, Ensti Pohjola, Erkki Pohjola and Paavo Pohjola. Liisa Pohjola was in the years 1965-1979 married to Professor Ilkka Oramo. Their son Sakari Oramo is a well-known conductor and his daughter Anna-Maaria Oramo barokkicembalisti and -urkuri.